When asked if they think wind-generated electricity is good, affordable, green, useful, and necessary most people will say ”Yes, of course.” But the fact is, none of these things have ever been proven. Wind- generated electricity has been effectively shielded from scrutiny by marketing and lobbying, with no obligation to verify industry claims. Wind-generated electricity has high impact and low benefit to Maine’s economy and environment. Following are 20 truths the wind industry does not want you to know, 20 reasons to take a closer look. The Oakfield Wind Project is now complete. A total of 48 turbines have been erected and are now producing electricity for SunEdison Inc.
Posted Sept. 14, 2015, at 1:32 p.m. The industrial wind lobby was not happy. Its plans to keep building hundreds of wind turbines in rural Maine were threatened by the LePage administration. During the summer of 2013, the Department of Environmental Protection, run by a LePage appointee, had made things harder for wind developers by putting more requirements into permit applications. The wind lobby saw the new requirements as illegal and obstructionist from an administration hostile to wind power. And they believed the red tape would slow down — even kill — the expansion plans of their multi-million-dollar industry. As the years go by, bumper sticker (“spin, baby, spin”) enthusiasts of wind power must be scratching their heads about a Vinalhaven turbine project that hasn’t lowered electricity costs. One would hope that reasonable people would consider reasonable evidence like comparing electricity bills. But beyond the bills, even if you don’t mind paying more for wind power, shouldn’t you care whether wind power is reducing carbon emissions or whether supporting wind power is ever going to amount to a solution to the energy crisis? “Avoid wind turbines. Live near your senator” is how one Vinalhaven wind turbine neighbor signs his email correspondence. It is an ironic but accurate point: there is not a single elected official on Vinalhaven or in the state of Maine who lives near or voted for wind turbines to be placed near their homes. The wind turbine industry is desperately anxious to avoid the costs of noise. As time goes by, data accumulates in support of the key contention by wind turbine neighbors: that the A weighted measurement scale advocated by industry misses the key acoustical component of dramatic health impacts. Read the following peer reviewed report in “Acoustics Today” to understand why. The general manager for a Vinalhaven utility says he and his attorneys are weighing all their options after a Superior Court judge sided this week with plaintiffs in a wind turbine noise complaint case on the Maine island. Judge Michaela Murphy’s decision overturns a 2011 ruling from the commissioner of the Department of Environmental Protection that the judge said “had no rational basis.” Susan Sharon has more. Until Nov. 2009 when the Industrial Wind Turbines were installed, FIEC rates tracked CMP rates as they went up and down. Toward the end of 2008 rates were dropping fast due to downward pressure from the falling price of natural gas. 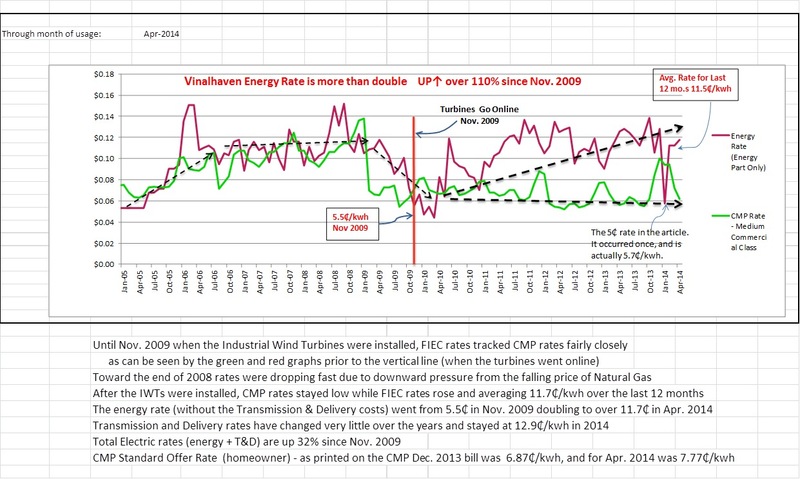 After the FIW wind turbines were installed, CMP rates stayed low while FIEC rates rose steadily. The energy rate (without the Transmission & Delivery costs) went from 5.5₵/kwh in Nov. 2009 doubling to over 12.7₵/kwh in Dec. 2013. Transmission and Delivery rates have not changed at 12.9₵/kwh. Energy rates (without T&D) have more than doubled (up 111%) and Total rates (energy + T&D) are up 32% since Nov. 2009. The court decision adds to criticism that the actions of Patricia Aho, Maine’s environmental chief, frequently benefit her former employer’s clients. Patricia Aho, commissioner of the Maine Department of Environmental Protection, is the target of renewed criticism over regulatory action that benefited clients of her previous employer, the Pierce Atwood law firm, where she was a longtime industrial lobbyist. This time, the incoming fire is from a state judge. In a ruling issued Monday, Kennebec County Superior Court Justice Michaela Murphy overturned a controversial decision that Aho made in June 2011 involving noise violations at a wind farm in Vinalhaven, saying there was “no rational basis or relevant evidence” to support it. Aho’s decision, which reversed the recommendations of the DEP staff and the state Attorney General’s Office, was the exact outcome sought by Fox Island Wind, which was represented by Pierce Atwood, the state’s largest law firm, where Aho had worked until earlier that year. FALMOUTH — Barry Funfar is a 67-year-old Vietnam veteran who spent most of his waking moments since retirement a decade ago working with the hundreds of flowers and trees he planted around the Colonial-style house that he built. Gardening was his exercise, therapy, and passion, and his doctors agreed it was beneficial to combat his post traumatic stress disorder. A Marine, Funfar flew 127 combat missions as a door gunner on Huey helicopters and was awarded seven Air Medals for meritorious service. GRAFTON – About 60 people gathered at the White Church in Grafton for the second in a series of three wind forums, this one focusing largely on the depreciation of the value of properties located near wind projects. The first forum – which was held last November at the United Church of Christ in Townshend – focused largely on the noise impacts wind projects have had in some nearby areas. One of those was the 19 turbine Hoosac wind project in the town of Florida, Vt. built by Iberdrola Renewables – a company headquartered in Spain – and another was the 24 turbine project built by Iberdrola in Groton, N.H.
Iberdrola Renewables built two test towers (MET towers) in Windham and one in Grafton on land owned by the New Hampshire based Meadowsend Timberlands Limited, which some believe is a precursor to an application for a large scale wind development project in Windham County. NOTE: Horace Hildreth, the sole investor of Fox Island Wind, is also a longtime board member of Maine Audubon. Did the wind turbine company willingly comply with ALL federal regulations for an eagle “taking”? Because if it didn’t, wouldn’t it be a violation of its own mission for Maine Audubon to include on its board an investor who profits from exploiting the Endangered Species Act? BARNSTABLE, Mass. (AP) — The town of Falmouth was ordered by a judge on Friday to limit the hours two town-owned wind turbines operate after neighbors blamed them for a series of health problems. Sue Hobart, a bridal florist from Massachusetts, couldn’t understand why she suddenly developed headaches, ringing in her ears, insomnia and dizziness to the point of falling “flat on my face” in the driveway. “I thought I was just getting older and tired,” said the 57-year-old from Falmouth. For neighbors of Vinalhaven wind turbines, these are true words. The recent feature story in New York Magazine just scratches the surface. The NY Mag story ends with the writer fleeing, “I was a little relieved to get away.” For nearby property owners on Vinalhaven, there is no getting away; either from the noise or the costs inflicted through no fault of their own. How would you like to live in a sacrifice zone? “On May 4, 2012, at around 8:30 a.m., air-traffic controller Mark J. Cool put two planes on a collision course over Cape Cod. “Runway 14” is what Cool heard the Coast Guard controller say when he okayed a Falcon jet for takeoff from the airport. “Runway 23” is what the controller actually said. That set the jet directly in the flight path of a twin-prop Cool had just released from another airport. On his radar display, two green splats lurched ever closer as he made a series of frantic radio contacts to set them on a corrected course. Cool’s supervisor and colleagues crowded behind him in a crescent of worry. The planes came within two thirds of a mile and 500 feet of altitude of one another. A few seconds later, they would have crashed. The answer: why are Vinalhaven electric rates so high? The reply brief, filed in Maine Superior Court, rebuts arguments by FIW and the State of Maine. Last week, attorney Rufus Brown filed a brief on behalf of aggrieved neighbors of the Vinalhaven (ME) wind turbines with Maine Superior Court. The filing represents a summation of the case related to noise from the turbines that has turned the lives of nearby residents upside down. For additional information and background, click this link. Well, those monuments are on North Haven Road. 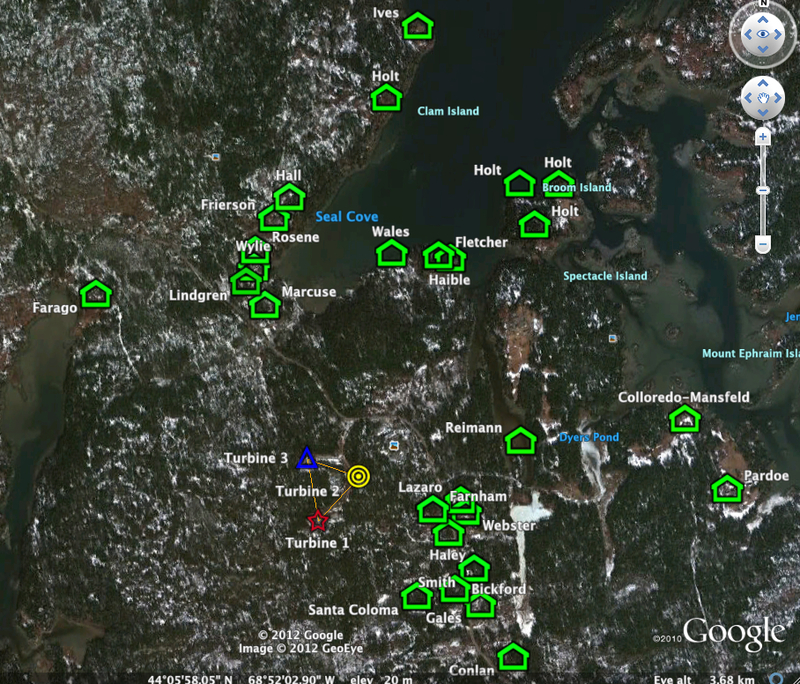 The following youtube clip was not taken on Vinalhaven but it does demonstrate noise levels affecting the health, peace and quiet, and property values of homeowners in the sacrifice zone of the Fox Islands Wind turbines. The von Trapp family came to Vermont, because it reminded them of Austria, where “the hills are alive with the sounds of music”. Those sounds will soon be replaced by the health-damaging infrasound and low frequency noise from 3 MW wind turbines on 2,000-ft high ridgelines, courtesy of GMP/Gaz-Metro-Canada.